Since we recently finished building a laundry room in our basement, I have been trying to find ways to make it pretty. I have already made this Chalkboard Wall Art to hold my lost socks and I wanted a sign on the opposite wall too. 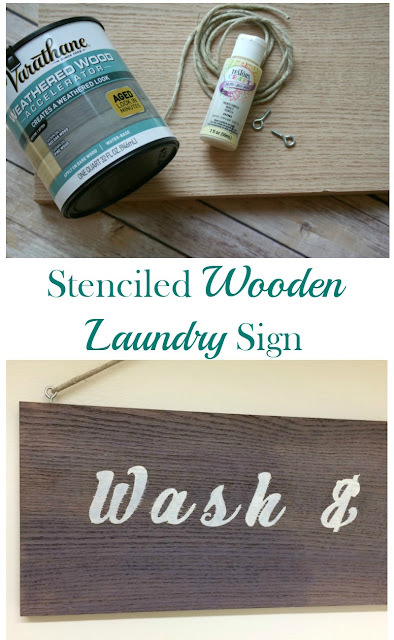 When I got the chance to participate in a Wooden Sign blogger challenge for Rust-Oleum, I knew I wanted to make something for the Laundry room. I picked up a mat to go in front of the washer and dryer that had a retro vibe, so I wanted to stay with that look. This post contains affiliate links, which means I receive a small financial compensation if you make a purchase using this link. Thank you for supporting Real Girl's Realm! I used a medium angled brush to paint one thin coat of the Weathered Wood Accelerator on the board. See what a big difference the stain makes! 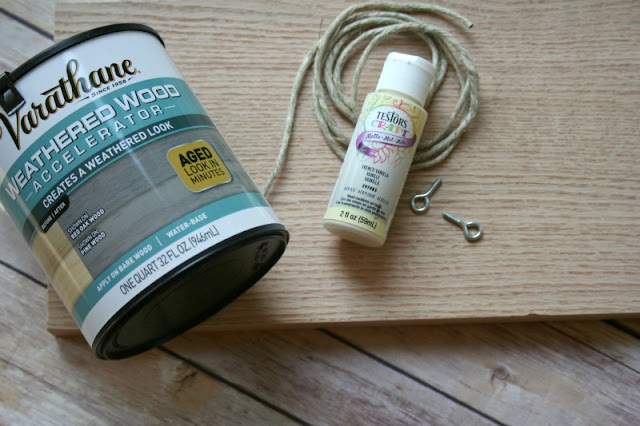 Even if you cannot get your hands on old barn wood, you can still achieve the rustic look. While the board was drying, I created my stencil for the wording using my Cricut Explore. 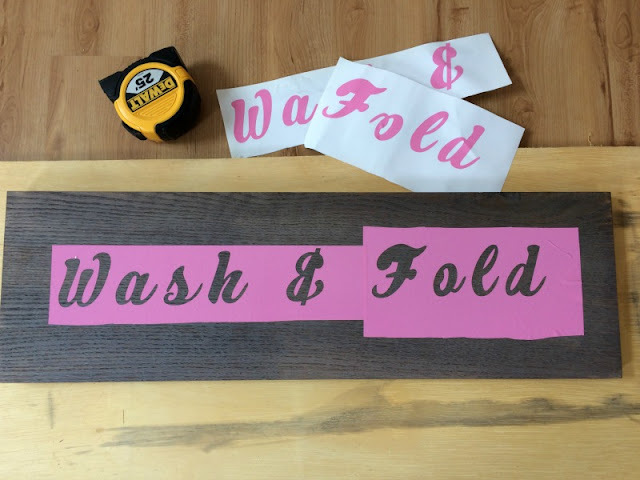 I used the Cricut Design Space software to write "Wash & Fold" in a retro script. I used regular vinyl, but Cricut does make a stencil vinyl so you do not have to waste the "good" stuff. 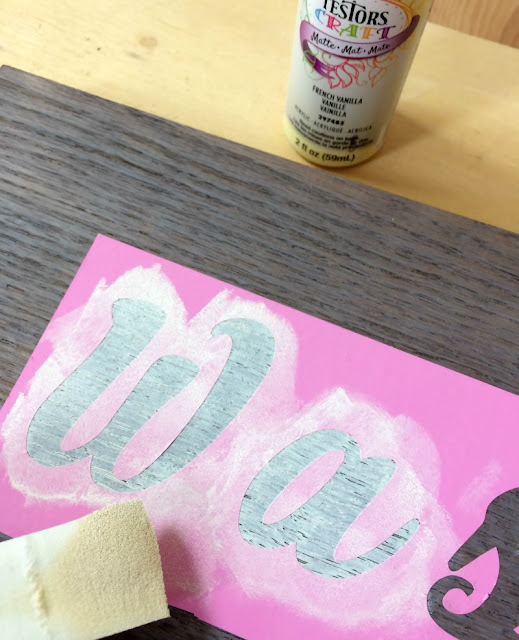 Once your vinyl is cut, remove the excess vinyl to use for your stencil. I measured and did my best to center the vinyl stencil on the board. 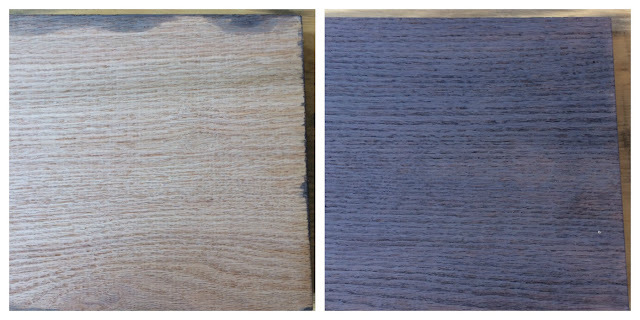 I used a makeup wedge sponge to apply two coats of the vanilla paint to the board, letting it dry in between coats. Once the paint was dry, I removed the vinyl. 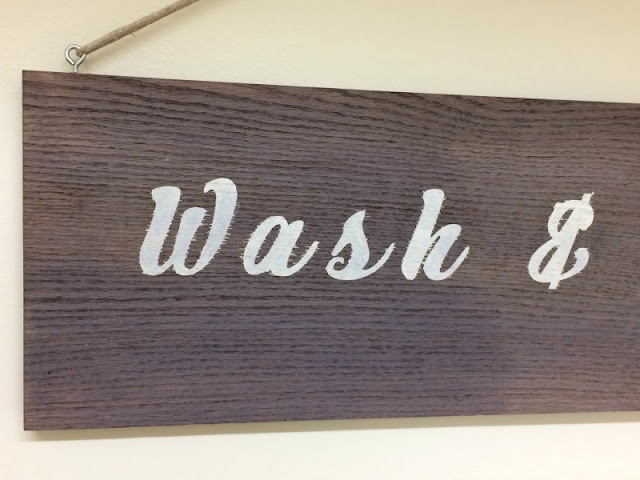 I did have a little bit of bleed through, but since the sign is supposed to have a rustic feel, I did not mind. 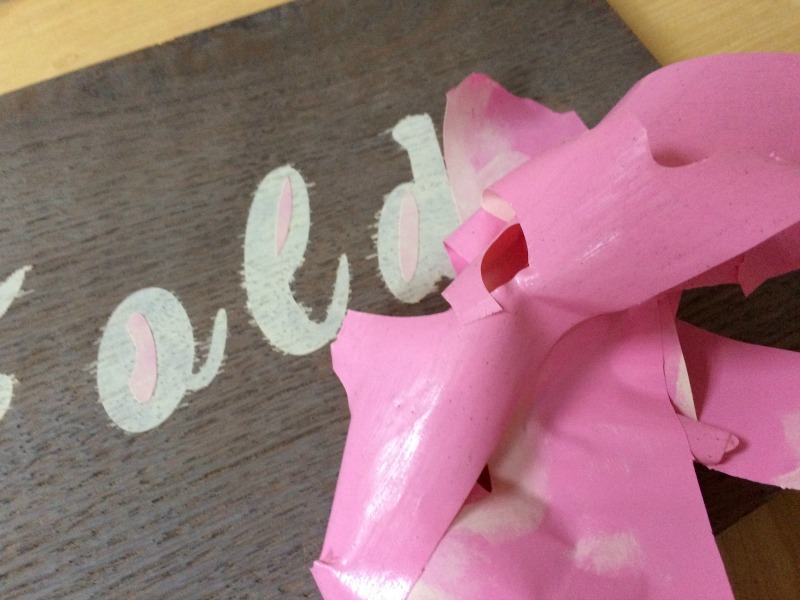 If you want even more of a distressed look, you could lightly sand the sign. I pre-drilled the holes for the eye hooks then screwed them in. I then tied the rope to the top of the board and hung it in my Laundry room. 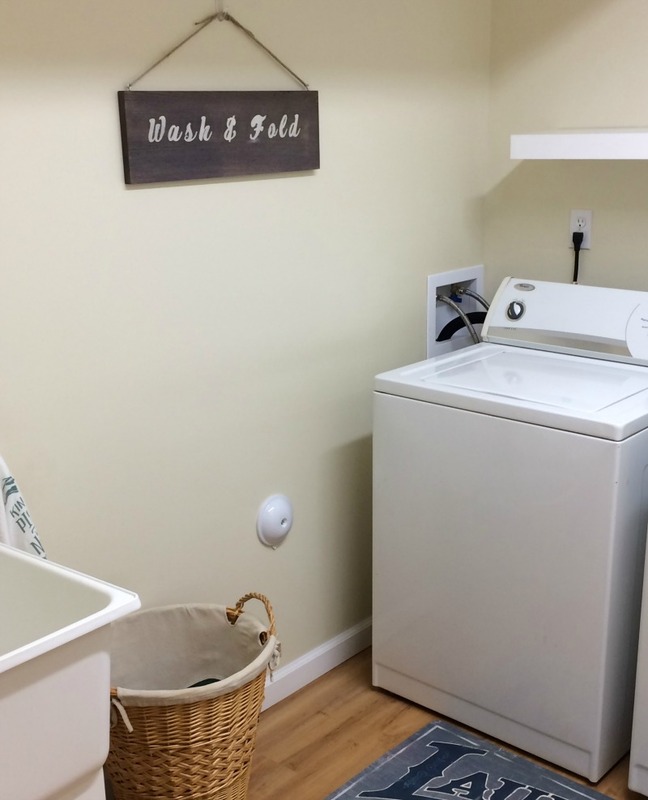 Check out the full Laundry room reveal! 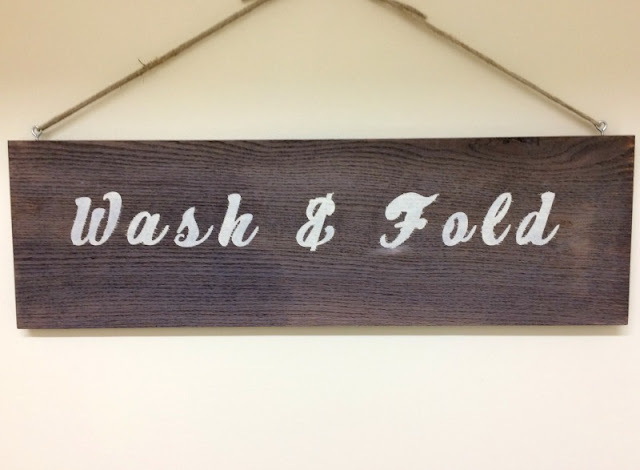 Have you ever made a farmhouse sign? If so, what does it say? Disclosure: I was sent product by Rust-Oleum' s Creator's Studio Team to complete this project, but all opinions are 100% my own. There is some sort of Mod Podge trick you can do to help prevent bleed through, but I can't remember exactly how you do it. I think it does add to the rustic look tho!! 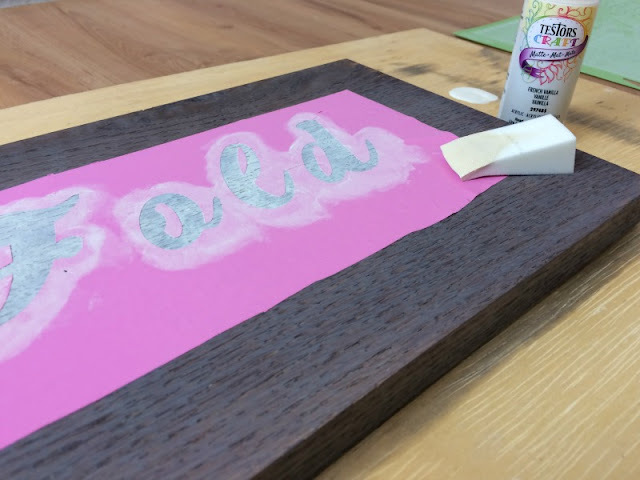 I love the idea of using a makeup wedge sponge to apply the paint! Brilliant! Love it! Oh, I think I have ran across that too, but will have to look it up when I make another one. Thanks for your kind comments! Oh, That is a good idea too!